In this issue, a quick synopsis of Cap’s history is given, how he is actually a “man out of time”. He is at one of his old love’s funeral, Sharon Carter’s aunt, Peggy Carter. He reminicses about how he should be an old man, and that it’s very sad to see some of his old friends go. Then the funeral gets attacked when Dum Dum Dugan gets a laser pointer aimed at him and Rogers tackles him out of the way. The assasin runs away and jumps on a motorcycle, but not before Rogers can see who it is. Someone he hasn’t seen since 1944. The ish then goes to a flashback of paris, 1944. Where you see the assasin, known as Codename: Bravo, is actually on the side of the americans, with Agent Carter and Cap. 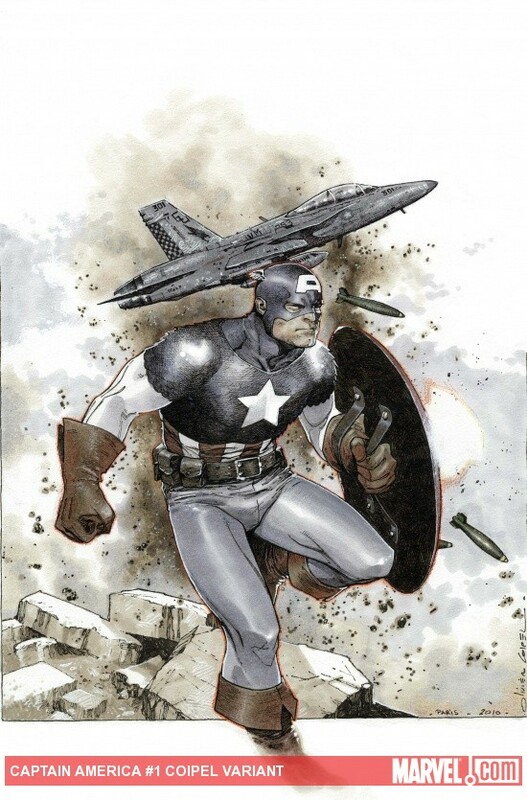 Brubaker continues to play with continuity and discovering new characters to bring to bear from Cap’s lengthy past. Who is Bravo? What is up with the catatonic nonresponsive old geezer? Peggy died? When? Review: I know if many people read this review, I am going to catch serious flack. I have not been a big fan of Ed Brubaker since he decided he was going to rip off practically every storyline he has done since Winter Soldier. All he is doing is reimagining tales from the likes of Gruenwald and others. Brubaker is a good writer, but I think he has been vastly overrated on his Cap run. He has basically had Steve killed (been done before, at least twice to my knowledge), brought back through mystical/science means (been there, done that) and had someone else be Cap, only to be killed, making Steve realize he must be Cap (at least twice before). For all the press about originality, I see a lot of others’ work in Brubaker’s writings and think he is merely trying to remake Cap in his image, while taking from the creativity of others. Not a fan of renumbering the books, but here is the story from Marvel. What was Captain America Volume 4 is now going to be Captain America and Bucky, and contain retconning galore so that Marvel continuity mirrors more of the movie continuity. I don’t care, as long as Bucky STAYS DEAD. Look, in the Fear Itself series, he got a hole ripped through his chest. Let’s not bring him back, eh? But I hear that is in the works as well. Sigh….. The art is fantastic, and the blank variant cover is a great idea. Now you can go to a comic con and get your favorite artist or the artist of this book to give you a sketch and have your own unique cover. I bought two blank covers for just this purpose.